Spike In Canadian Work Permits for U.S. Residents (Audio) - Canada Immigration and Visa Information. Canadian Immigration Services and Free Online Evaluation. Is Canada already seeing the impact of a tumultuous U.S. election campaign that many fear will result in Donald Trump becoming president this week? It could be the first hard evidence to support the belief that Canada could reap the benefits of the apparent instability of American politics, particularly if Trump makes it to the White House. Canadian companies are openly admitting to targeting American staff based on concerns over Trump becoming president. The Republican candidate has vowed to tear up the North American Free Trade Agreement (NAFTA) with Canada and Mexico, which he calls the worst deal ever struck by his country. Then there is the wall Trump says he plans to build along the Mexican border if he is elected. His opponent, Hillary Clinton, has a more balanced approach to immigration, although she has been plagued by an email scandal that looked to have gone away, before the FBI decided to reopen the case and then close it again in the week before the election. Christopher Reid, found of Ontario software developer Sortable, told Reuters he ran an ad campaign in the U.S. specifically targeting Americans and other residents concerned by Trump – and found two people he wants to hire. Others have reported a new momentum in interest from Americans seeking opportunities in Canada. The new fast-track visa just announced by the Canadian federal government could make the process of bringing these workers in much more efficient. Finance Minister Bill Morneau unveiled a plan aimed at making it easier for growing firms and major companies to get access to the highly skilled foreign talent they need that is not available in Canada. The new plan is to allow companies that qualify to get visas and work permits approved inside two weeks as standard – under the current system the minimum processing time is six months. Planned changes will also see the creation of a 30-day work permit that can be spread across a year, meaning companies can bring in workers for short stints without the need to apply for new paperwork each time. Canada is also looking to reap benefits in terms of international students. It is a stated goal of the federal government to make it easier for those who graduate from Canadian universities to stay and begin their working lives in the country. This is likely to mean giving students more points under the Express Entry system. With America, currently the dominant worldwide destination for international students, Canada is aiming to present itself as a viable alternative to those who are put off by the growing anti-immigrant movement in the U.S.
Matthew Barasch, Equity Strategist at RBC, believes Canada could witness a ‘brain gain’ from the U.S. as a flipside to the ‘brain drain’ it traditionally battles against. 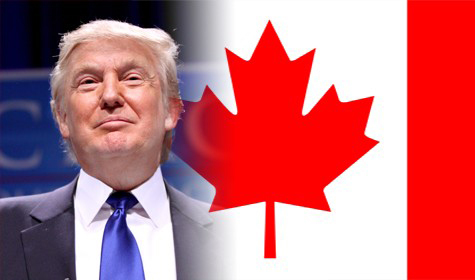 Instead of losing the brightest minds to the lure of major U.S. companies, American and international talent will start to favour Canada over its southern neighbour. The U.S. saw a spike in Google searches on the day Trump won a swathe of Super Tuesday states in the race for the Republican presidential nomination. Trump was initially seen as an unlikely candidate to win the nomination, but as the prospect of him challenging for the White House became real, many Americans began looking for a way out. Colin Singer, Managing Partner of immigration.ca, was recently quoted in a CNN Money article about what it takes for an American to move to Canada. You can also watch him being interviewed on the subject here.